Jerome Olivet seems to have a fresh idea how a future Media Center should look like. 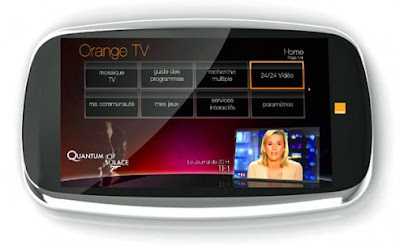 His new concept design – Magic Orange Media Center system that consists of 4 components: Silver, Magic, Flower and Circle. Silver, is a pebble shaped touchscreen for navigating content. Magic, is a wand of sorts, equipped with gyroscopes to elevate remote controls to dexterous gestures. Flower, is multimedia box with a hidden camera underneath the transparent skin. Circle, is a floating buttons on a round touch pad. No further explanation how the four components interact with each other, guessing Jerome is trying to implant modern multi-touch surface technology into the Magic Orange Media Center concept?